Today after we wrapped up our morning lessons, the littles flew up the stairs and into their rooms and all around the house in a flurry of activity. At some point (I’m not sure when) they had consulted and decided what they wanted to do together after they were done with school. And it wasn’t begging to play on electronics or watch a video. That was a wise decision today. Princess came out in my eighth grade graduation dress that my Mama made special for the occasion. Yes, she’s three years younger than I was at the time, and yes, she is as tall or taller than I was at thirteen. Thank you for asking. Cooter came out wearing his repurposed and embroidered Chef shirt I made over for him from a GW Boutique purchase Christmas 2012. They explained to me that they were opening a restaurant, and that I was to come place my order. This was timely as it was lunch time and I needed to throw something together for their lunch, but their minds were set. Their restaurant, my order. Princess had set up a wooden TV tray table at the foot of the stairs complete with a menu and prices (so convenient–don’t you hate it when they don’t have the prices–that never turns out well). She was a lovely hostess, and as I placed my order for pizza and sushi (hey, I was hungry), she wrote it all down. She told me it would be ready soon, and I was dismissed. I heard some hollering back and forth–it was hard to decide if this was fine dining or a diner–and some skerfuffling and a few minutes later, Princess called out that my order was ready. I was a little taken aback, if I’m being honest here, because I thought she had told me my food would be brought to my “table.” I expressed my concerns, and the lovely hostess apologized and said it would be brought right out. I was sitting in my comfortable spot, when Chef Cooter brought out my tray himself. What a good chef! He wanted to see the joy on my face himself, I guess, which I thought was sweet until I saw the twinkle in his eyes. Ah yes. The pizza. He had put mushrooms as the topping. Just for me. And I realized this, just as he was about to force feed me a “bite” of the pizza, giggling harder and harder as he approached my mouth with it. As I’ve shared before, I did not care for them growing up. Acting ugly about them or turning my nose up at them was not tolerated. I was expected to eat them just like everyone else. Until I was grown. And then Mama wanted my picked off/picked out mushrooms. She loved them, you see. We were a perfect match when it came to eating a veggie pizza. And Cooter knows all of this. And he deliberately put the mushrooms on that pizza for me today. I felt loved. So very loved. That sounds crazy and counterintuitive, I know. And I’ve thought about how to write about this so it made sense for hours now, and yet I still don’t know how to do it justice. But when he teased me like that, with that giggle and twinkle in his eye–I knew three things. He knows me very well. He loves me so much to tease me and make me laugh like that. He is so comfortable with me that he knows I will laugh at this thing he did and not take offense. And he really wanted me to laugh. As I pushed the pizza away with all the drama and disgust I could muster, we were all three laughing and Miss Sophie was dancing around, wondering what all the excitement was about. Mushrooms, Sophie. And so much more. Tonight I’m thankful for the love and laughter. For being known. For parents who loved me and for the children who continue to make me smile and laugh and give me a reason to look forward to another day. 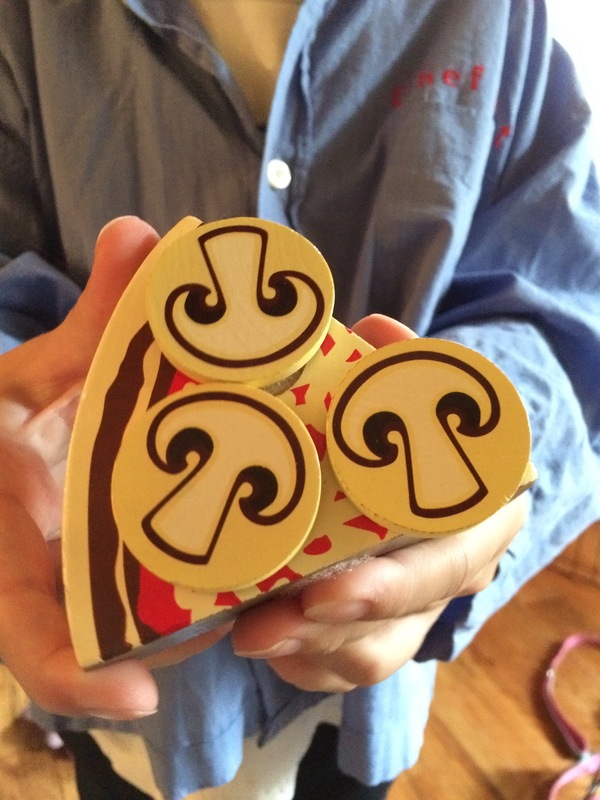 For their fun and creative spirits and joy-filled hearts, I am grateful. And most of all, for twinkles in eyes and that the teasing that came with living with my Daddy is carried on, I give thanks. May you all have someone who teases you with a twinkle in the eye and who makes you laugh and laugh. Love and laughter to all. This afternoon we were on our way home after our Princess’ ballet recital in Macon at my alma mater, Wesleyan College. My husband had headed home down the main interstate when we came up to traffic backed up to a complete stop. He decided to get off at the Eisenhower Parkway exit and take a different way home. 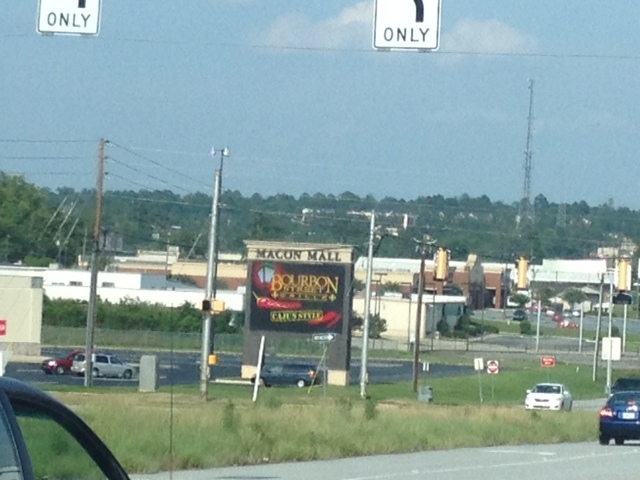 This used to be THE happening exit when I was little–it was the way to the Macon Mall, whose heyday has come and gone. Oh, but in its day…..
All of a sudden we sat up taller. Atlanta? Really? Wow. WOW! I don’t think we’d ever been to Atlanta before. The Macon Mall sign today, a bit different from the one that I saw that night so many years ago. The sign said: Macon Mall. And I replied in amazement, “Wow. They have a Macon Mall in Atlanta too?” Yes, people, that right there was one of my best slam forehead to desk moments from my childhood. And yes, truthfully, I was that gullible. Probably why Daddy liked teasing me so much. Today it tickled me that my girl was very aware of where she was. Maybe she just gets out more than we did when we were her age…..or maybe, just maybe, she’s a whole lot smarter.